Whatever you think about Ronan Keating as a person, you can’t argue with the fact that over the past two decades, he’s sang on some of the finest pop songs known to man. ‘When You Say Nothing At All’ is a contemporary pop classic, and Boyzone’s takes on pop standards were as good as any in the business. Recently, he hooked up with legendary songwriter Burt Bacharach in the US for a hasty recording session, from which these ten songs emerged. Keating says that he didn’t get to spend as much time on these songs as he would have liked, but the results don’t show anything lacking. Opening with ‘The Look of Love’, it’s guaranteed that you’ll know this material and have heard these songs many, many times. Bacharach was one of the best songwriters ever, and this album reminds us of that. But how do these songs fit into the Keating canon? Very well, actually. Always the strongest singer in Boyzone, and with a bundle of decent solo singles, we know Keating has the chops for monstrous tunes like these. ‘Walk on By’ is a particular highlight, as is ‘What the World Needs Now’, and all sound like the Keating you have heard countless times before. That’s what this album is, a record for Ronan Keating fans, for Boyzone fans, and for pop fans generally. 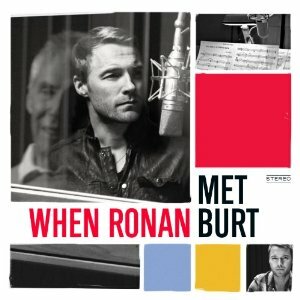 If you spend your time musically gazing at your shoes, you know this album isn’t going to be for you, but if you’ve been a fan of Ronan Keating in the past, it’s an album to make yourself comfortable with. If just for his take on ‘Arthur’s Theme (The Best You Can Do)’. Why has he never covered it before? Fantastic. Within its genre, it’s a 4 star record. In its genre, Andrew. You have to look at it that way. For an album from a boyband singer, it’s a 4 star record. While Radiohead’s album has to be judged against their other records, as well as their contemporaries.